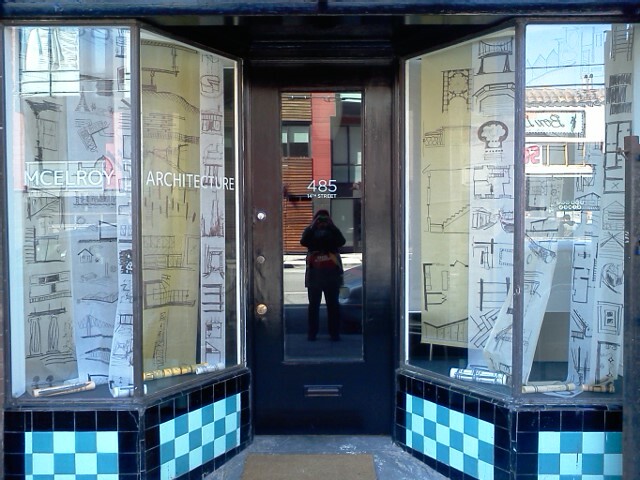 for 3 years I walked down 14th Street on my way to work and passed by a little architect's office. I keep meaning to poke my head in there and say hi, because I like that method of networking a lot, dropping by and introducing myself when in the area. On my last day of work, I was again about to rush past the architect's place when I noticed their window display, and it struck me as a brilliant piece of advertising as well as design. I had to stop and photograph it, though my Android phone lacks a great camera, so I hope you'll excuse the reflections and low lighting. S/he or they (not sure how many people work there but I see 2 people sometimes) have taken a very simple idea, just rolling out some trace paper and drawing onto it with quick pen & marker hand-sketches, elevations, perspective illustrations that are so lovely and enticing that they are works of approachable art as well as great examples of the architect's process. They made multiple rolls of this momentary art as wallpaper strips, hanging as if they could be rolled back up and put into a blueprint tote to run across town for a client meeting on-site. Using multiple types of paper, from yellow to bright white, thicker to thinner, in several widths, creates depth and adds interest, drawing the viewer in, if you'll pardon the pun. I expect creating this window display was fun, a happy way to spend an hour or two, doodling and imagining the built environment in the way that architects and interior designers such as myself like to do. Even more than that, this display doesn't take many resources, requires a low investment in time, is endlessly reusable and recreate-able, and costs very little -- all highly prized sustainable values. It delivers a strong message that clearly communicates the skill, passion, vision and knowledge of the designer, while appearing approachable and likeable, all without using any words and never showing a human face - 2 of the most powerful motivators in advertising. I admire the mind that thinks this way. I did go introduce myself to Tom McElroy, and we had a lovely conversation at his office. Several months later, at a networking holiday party, I bumped into Tom again, and he was even more conversational with a drink in his hand and a festive hat. I highly recommend Tom if you need any architectural or renovation work done. categories / "advertising", "architect", "architectural", "interior_design", "marketing", "networking", "sustainable", "sustainable_design"